Byrdseed.TV's Spring Window opens on May 1st. Get on the waitlist! Are you using Wolfram Alpha for math data? Intriguing, authentic data can make or break a math project. I keep a list of bookmarks to surprising data I’ve found around the web. But what if you know what data you want to find? Sure, you could Google it, but an even better source is Wolfram Alpha, especially if you’d like to work with the data as well. Then, say I want to know how the population compares to the area? Easy! 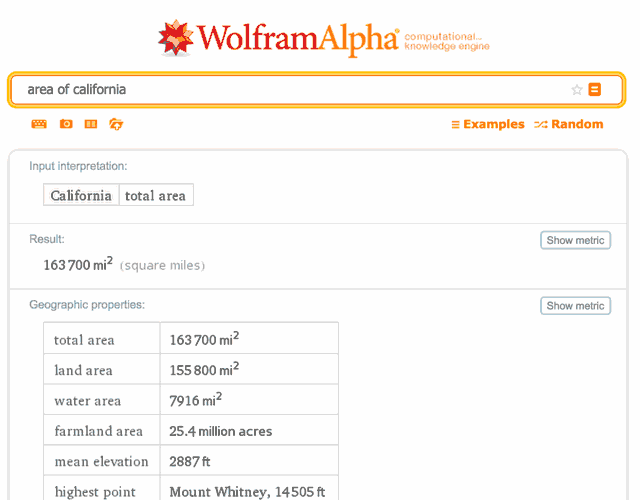 Just type it in like a math operation: population of California / area of California and we see that there are 237 people per square mile. Well, how does that compare to the fine state of Montana? Run the same calculation and you’ll see that they’ve got just under 7 people per square mile. Wow! What a perfect way to teach ratios or proportions! What else could you look up? Give it a spin! See what the limits are. Wolfram Alpha is great inspiration for building intriguing math questions.